You can maximize the surround sound experience in a home theater by positioning the surround sound speakers properly. The speakers in a home theater system include the center channel speaker, the left and right front speakers, the surround channel speakers, and the subwoofer. Here’s what a surround sound setup looks like. Some people say the center speaker is optional, because the left and right speakers can handle the sound that comes from the center speaker. However, the center speaker anchors your onscreen dialogue and serves as a seamless connection between your left and right speakers. As that boat zooms by from left to right, you don’t want to have a gap in the middle of your sound field. Make sure any speakers that will be close to a cathode ray tube (direct-view) video display are video shielded — especially the center speaker. If not, the speakers will cause video distortion on your screen. The left and right speakers provide more lateral, but still highly localized and directed, sound. 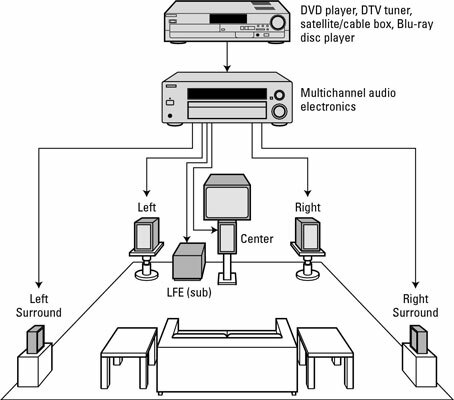 If possible, the left and right speakers in a surround sound system should be full-range speakers. For the best results, try to position the left and right front speakers so that the tweeters are at ear level. The surround speakers (whether you have two, three, four, or more side and back speakers) add a third dimension to your audio programming — bringing a front and back dimension to the left and right dimension provided by the front speakers. The subwoofer can complement your full-range front speakers, providing an even fuller bass signal. The subwoofer can handle all the bass, giving your front speakers the ability to focus on the mid- and high-range frequencies. Most home theater experts will advise you to move all bass to the subwoofer. This results in more power and attention to the mid- and high-frequency drivers and less strain on the amplifier and speaker systems. This setup also gives you a more dynamic range, because the bass can go lower than most full-range speaker woofers can themselves (hence the term subwoofer).